We're pleased to have heard from Jaydean Dawkins, founder of the Confessions of the Youth Theatre Company, who let us know how they got on with the funding from our Dragons' Den 6. The young people who made an brilliant pitch were awarded £500 to write and perform a musical, involving the community. Here's what Jaydean had to say: The Theatre Company was founded in Radstock in 2014, the company was born out of my desire to provide free and affordable arts for all children and young people. I have been working with these children for the past 4 years and have fallen in love with their creativity and passion to make theatre. They thrive in the creative space and we have been able to work with 84 children in total so far and will be extending this in the new year. 24 Young people ages 4-15 were able to create a devised play called ‘Locked In'. 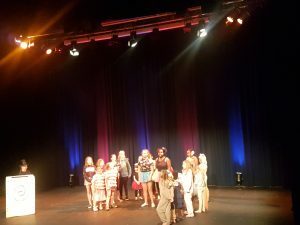 During this process they were able to work creatively, collaboratively, build confidence, improve their writing and acting skills which would be performed at a theatre. For many of the children from the area it was their first time performing on a stage, I was able to take the children to a theatre where they experienced a backstage tour and had the use of dressing rooms and stage. They were able to experience the life of a performer. This project was open to all children and young people and the community was invited to come along and experience community theatre.